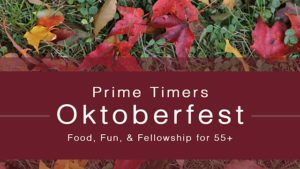 If you are age 55+, and love eating, Prime Timers Oktoberfest is something you might want to be a part of! If you’re age 55+, Prime Timers ministry would love to have you involved. It’s Oktoberfest time—we’re celebrating with a potluck and fellowship meal. Bring a dish to share and meet us by the fireside room here at church. Saturday night, October 20th at 5:30pm. Please sign-up online or at the Connect Desk. Contact Lois Wood 320.808.6035 for more details. I give Lake Community Church permission to use my / my child’s photo.I do not give Lake Community Church permission to use my / my child's photo.